Sugar can be a villain in the fight to maintain oral and overall health. But people watching their sugar intake and overall health don’t have to starve their sweet tooth all the time. This recipe for healthy corn muffins replaces granulated sugar with 1-3 teaspoons of raw honey for a light hint of sweetness without the guilt. Honey has antioxidants known to support a healthy heart and is lower on the glycemic index (GI) than sugar, meaning it don’t raise blood sugar levels as quickly. Although honey has more health benefits than sugar, it’s still mostly sugar by weight and should be used in moderation by people on a low-sugar diet. These muffins won’t put a dent in your oral health, and they support overall health, too. Using whole white wheat flour makes these corn muffins a good source of fiber while keeping the milder taste and light color of all-purpose flour. Nonfat plain Greek yogurt is packed with protein and may be friendlier to people with lactose intolerance. Pro tip: You can swap the whole white wheat flour for a gluten-free flour mix. In a separate bowl, mix the yogurt, milk, and melted butter. Add the honey, one teaspoon at a time, and stir. Since you haven’t added the eggs yet, you can make sure your batter is to your liking after each teaspoon. Avoid using more than 3 teaspoons to keep the recipe low-sugar. Beat the eggs in a small bowl and add to the wet mixture and stir thoroughly. Add the wet ingredients to the dry ingredients and mix until you make a fluffy batter. Spoon mixture into muffins cups and bake for 10-12 minutes. 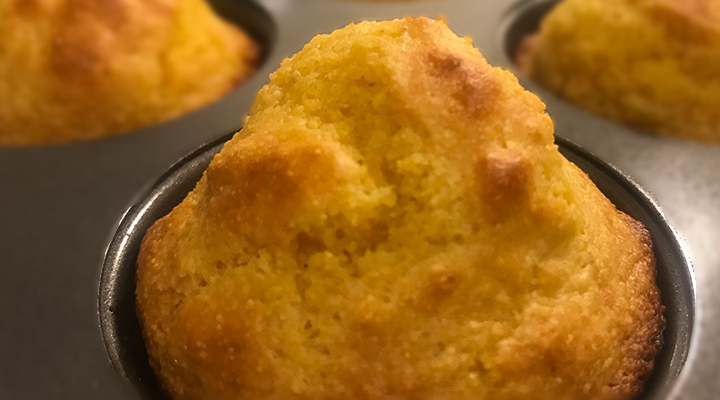 Enjoy these healthy corn muffins all year long, whether you pair it with a bowl of chili in the cooler months or bring them to a backyard barbecue in the summer.